Owl Tycho, age 14, is not your average teen. Her parents make a modest living selling magic potions from their back door, and thanks to a unique blend of magic genes, Owl is a wereowl. When she’s not attending school with her unsuspecting human classmates, she takes nightly flights around the woods and spends long evenings perched outside the window of Mr. Lindstrom, her science teacher and long-time secret crush. While watching over her beloved’s home one evening, she spies a strange boy lurking in the woods nearby. At first, she suspects that this boy is up to no good…until it soon becomes apparent that Houle—as she decides to call him—can barely take care of himself, much less harm anybody. Using her owl form to hide her identity, Owl gradually transfers her attentions from Mr. Lindstrom to Houle, but there are questions that soon demand answering: who is this boy? And why does he insist on living in the woods behind Mr. Lindstrom’s house? 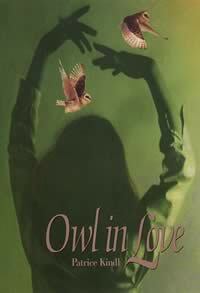 Owl in Love is a sweet, charming, and very cute stand-alone novel. I would recommend it to female teens of any age looking for a light, quick read to pass the time. I also made a book trailer for this novel, as seen below. Let me know if you like it!